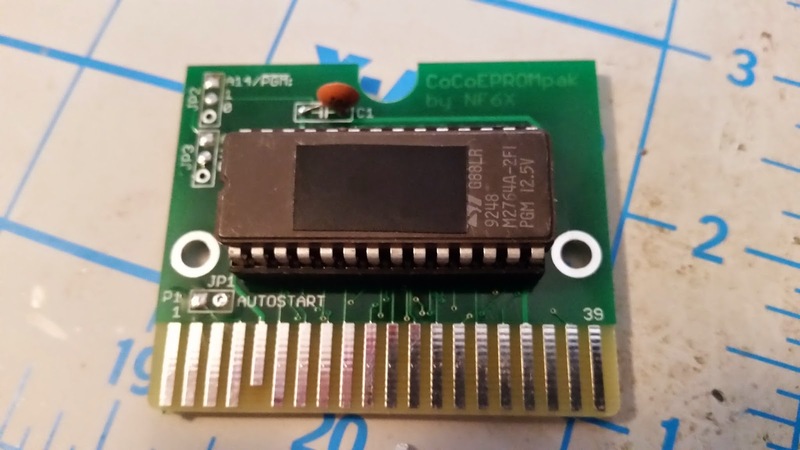 The circuit board for a game cartridge tends to be just a simple "carrier board" for the EPROM containing the game. More advanced cartridges exist, even for the CoCo. But the starting point is just enough circuitry to support attachment of a memory chip to the computer. Mark J. Blair, a member of the CoCo mailing list, designed such a board a while back and made it available for ordering through OSH Park. He even went a step further and made the design files available through GitHub. 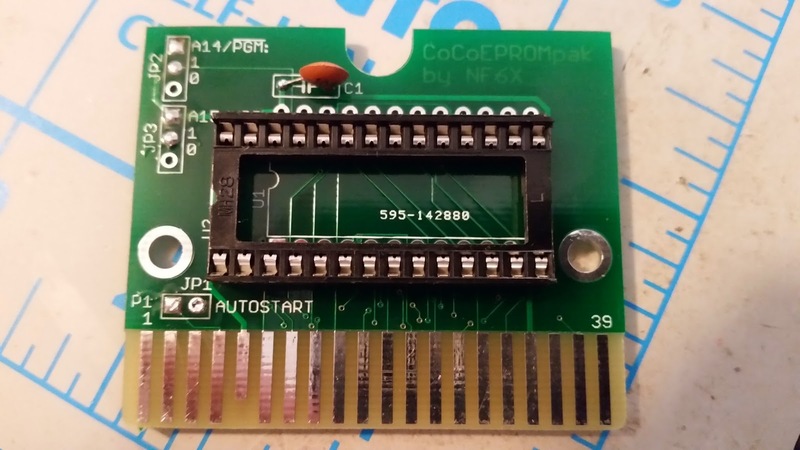 So if you need to make a ROM cartridge for a CoCo in a hurry, then now you know a good way to get the PCBs! Each board manufacturer tends to have slightly different preferences or requirements for how board designs are sent to them, and the Hackvana folks are no different. 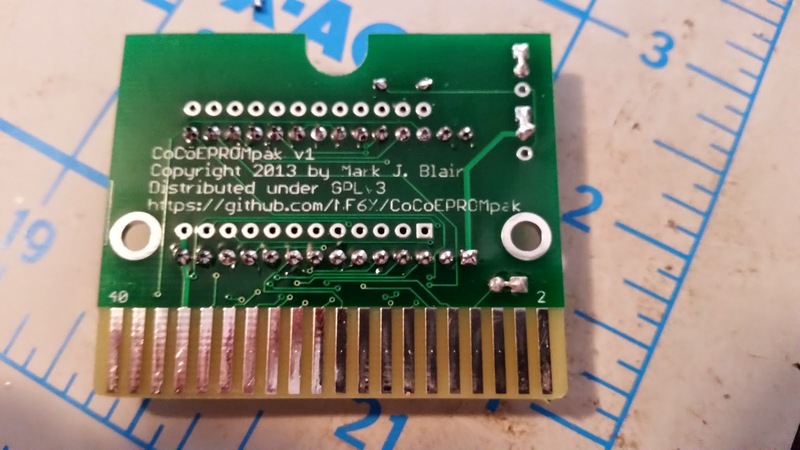 Mark used the Eagle PCB design software for his design, and Hackvana offers some design rules files for Eagle on their site. Fortunately the CadSoft folks also offer a free-as-in-beer Linux version of the Eagle software, and I was able to load the Hackvana rules into Mark's design files. I then used another Eagle script from Hackvana to produce the required Gerber files. Since Mark's design is released under GPLv3, I have released a tarball at the link above with my Hackvana adaptation of Mark's design. The orginial OSH Park Gerber files are still there if you need them as well. Building the PCB is as simple as the design itself. There are barely any parts at all! The first step is to install the IC socket. This is not strictly necessary, but it does make it much easier to replace the EPROM if you want to burn a new release of Fahrfall! :-) Also included is a small capacitor used to stabilize the power supply for the EPROM. Slightly more difficult is handling the jumpers. Mark's schematic describes how the jumpers should be set for the various EPROM options. 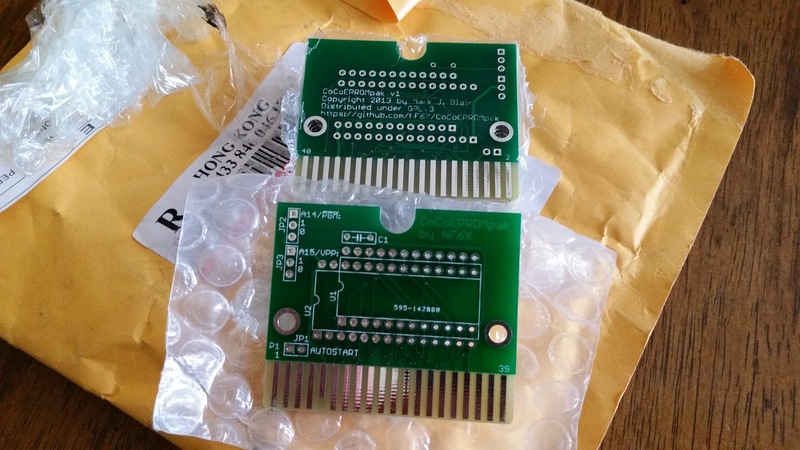 The PCB is intended to use removable jumpers on pin headers, but I didn't want to bother with those for this project. Instead, I just did a little sloppy soldering and bridged the connections I wanted. This saves me a little bit of wire trimming or parts acquisition and placement, at the cost of a little more trouble if I want to reuse the board with another EPROM later. But really, who would ever want to replace Fahrfall?? Hey, I read your post and it is very useful and informative. Thanks for sharing. Hey, I'm glad you enjoyed it! are easy and quick to make by adding a layer of water piping to the board to hook up the wires and components. I really like your writing style and how express your ideas. Thank you John.